Everyone deserves the chance to take a relaxing, fun vacation without breaking the bank and stressing over money, and that’s why we have put together a list of helpful money saving tips for an unforgettable vacation at our Gatlinburg cabin rentals. From tips on how to save money on food to how to enjoy a bigger cabin for less, we’ve got all the advice you need to have a dream vacation without breaking your budget! The first step to planning an affordable vacation at our Gatlinburg cabin rentals is to make sure you check our specials and deals before booking your stay. We have a variety of discounts that change with the seasons, as well as year-round savings for military members, so check out all the options to decide what deals would be most helpful to you! Because exploring the great outdoors is one of the most popular reasons to visit the Smokies, we also offer a variety of free tickets to some area outdoor adventures! There’s no better way to see the sights than by soaring through the sky on a zipline tour or trotting down the trails on horseback, so check out our selection of free tickets and get ready for the ultimate nature experience! When you think about vacation, you probably think about spending lots of money on eating at a different restaurant for each meal. While discovering new foods can be a fun part of the trip, the cost can get to be too much. Luckily, our cabins include fully equipped kitchens that make it easy and fun to prepare meals for your family. We recommend stopping at a local grocery store before you drive to your cabin and stocking up on a few of your family’s favorites. Plan to eat a couple meals in the comfort of your cabin, and splurge on one awesome meal each day in Gatlinburg! This will not only save you a lot of money but will also make your meals out more exciting! Another great way to stretch your budget at our Gatlinburg cabin rentals is to call up your closest friends and invite them along for the fun! Not only will you have a blast spending a few days catching up with your friends in the mountains, but the more people you invite, the more money you’ll save on the cost of the cabin! Our cabins are equipped with all the most entertaining amenities, making it easy to spend day after day hanging out with friends and playing pool and air hockey in the game room, watching movies in the theater room, soaking in the secluded hot tub and catching up on all the latest gossip! Not only can you save money by inviting a few friends, but you can also avoid expensive boarding costs by bringing your pup along for the adventure! 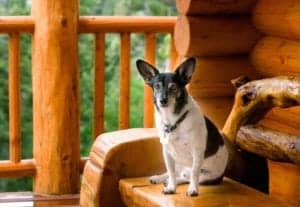 Our pet friendly cabins have all the same great amenities with the added bonus of allowing you to include Fido in the fun! You will love having your 4 legged critter with you during your time in the Smokies, and you will love not having to deal with the cost and hassle of boarding. Not to mention, your pup will love being included! Now that you’re an expert on vacationing within a budget, book your stay at our Gatlinburg cabin rentals and prepare for the weekend of a lifetime!